In Chiang Mai, the Loy Krathong festival is coupled with the Yee Peng festival of lights (also known as ‘Yi Peng’). The celebrations occur over a 3 day period around the day of the full moon in the 12th month of the Thai Lunar calendar. 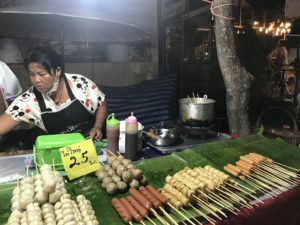 Loy Krathong is celebrated around Southeast Asia, but Yee Peng is unique to Chiang Mai. 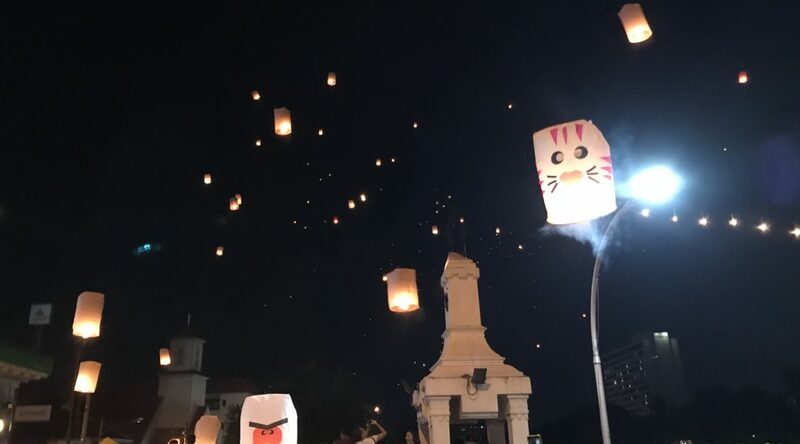 The main event of Yee Peng is the release of the ‘sky lanterns’. These are essentially hot air balloons – they are formed of a paper cylindar with a metal section at the base. This metal section is covered in kerosene to make it flammable. You light the kerosene and hold the edge of the lantern until the air inside heats up enough for the lantern to fly. At this point you release the lantern into the sky. 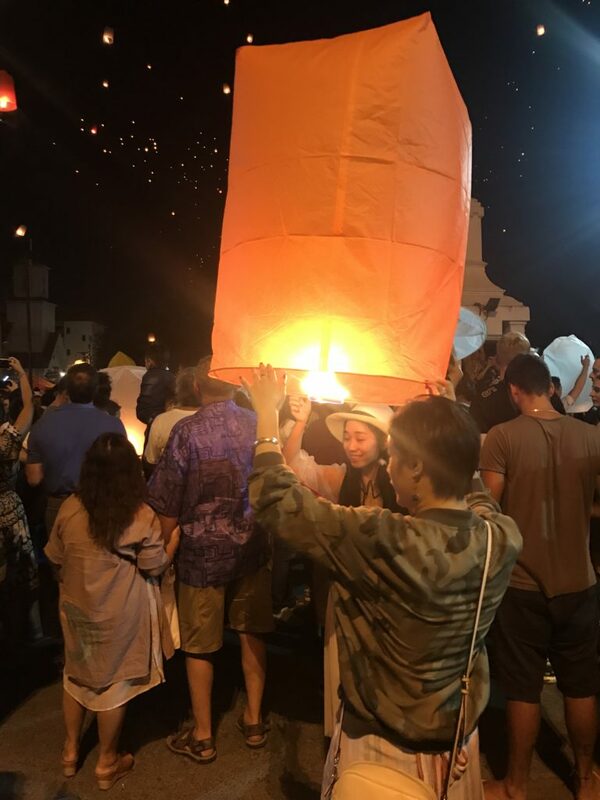 In Chiang Mai it is illegal to release lanterns in any place or time other than designated spots (although in practice people do release them all over the city). This is so that air traffic can schedule their flights to avoid air space that’s filled with thousands of small flying objects! There are usually two main release points: Mae Jo University and Nawarat Bridge. We decided to go to the Nawarat Bridge release as it was free, and also the only official launch point. The release was scheduled from 7pm -1am. We decided to go on the dot of 7, as we figured that there would be a big release of lanterns at this point. Walking up to the area was pretty cool! All the houses and hotels were decorated with lights and candles. Lots of people were out and about, all with a smile, a wai and a ‘Sawadi ka’ (traditional Thai greeting). In the distance you could already see a column of lanterns (I guess people got excited and released a little early!). When we got to Nawarat Bridge it was madness! So many people, and practically every group was lighting lanterns. It was totally exciting, but also a little scary at times. The pavements (sidewalks) were packed, so you had to walk in the road. The trouble was that even with Yee Peng going on they didn’t close the bridge to cars and bikes. There were also a fair few beginner lantern lighters. And apparently it’s not as easy as it looks! So, we found ourselves walking down the middle of the street, each carrying a small child, dodging vehicles. Then every so often you’d hear cries from a crowd behind you, at which point a sky lantern would fly over just your head (hopefully) and descend on the crowd. Several times we had to watch people duck out of the way to avoid setting their hair on fire! The other rather dubious part of Yee Peng was the string of lights along the bridge. But everyone loves fairy lights, right? Well, yes…apart from when they’re in the flight path of thousands of small objects crafted from paper and fire. If the lantern owners didn’t wait long enough before releasing, the lanterns wouldn’t rise quickly enough and would get caught on the lights. At this point they would usually double over, and the entire thing would combust. The metal section would eventually drop, hopefully onto a space that had by then been cleared of people. Fun? Absolutely. Somewhere I wanted to have my children? Not really! As I mentioned before in my article about Loy Krathong, wherever there’s people in Thailand, there’s food! We headed off, picking up a few things from the street vendors on the way. We decided to drive back past the Mae Jo University Sky Lantern release as it was on our way home. The Mae Jo Yee Peng is run by a (rather opportunistic) company. They charge a large amount of money for entry (around $150 per person) and then schedule a huge release.